Arkansas blue phantom and white tabular crystal cluster is in regrowth on three 'sides', features a neat tantric twin, has rainbows, and nice athletic energy. 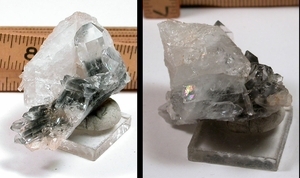 A miniature of 1-1/4x 1-1/2x 2-1/2", it can self-display in three attractive ways so you can remark on Isis faces, extra prism faces, and the dark shale phantoms; a few and trivial fleabites, a record keeper, several uncommon 7h faced crystals. Write when you finally surface!